On Wednesday evening, April 22, a special Mass was held at Notre Dame Convalescent Home on West Rocks Road in Norwalk. The chapel of the Convent of the Sisters of St. Thomas of Villanova was re-dedicated after being recently restored by members of Knights of Columbus Council 14360. 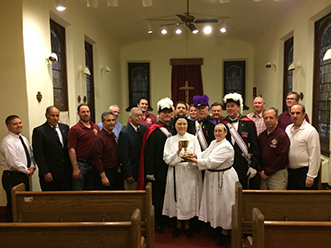 The Brother Knights, led by Tim Horne, helped restore the chapel after it had sustained significant water damage in January.